Though billed as a romantic comedy, the plot synopsis for 2015’s Tumbledown may leave an impression of a more serious film. After the death of her famous singer/songwriter husband (Damien Jurado), Hannah Miles (Rebecca Hall) struggles to move on with her life. Into Hannah’s low-key rural Maine existence steps Andrew McCabe (Jason Sudeikis), a pop culture scholar who wants to write about Hunter. Initially Hannah resists this endeavor, but eventually she agrees. This leads them into a professional relationship that may turn personal. And by “may”, of course I mean “definitely”, though perhaps not in the manner one might expect. As I stated earlier, the story of Tumbledown doesn’t scream “rom-com”, and the movie avoids much of that genre’s feel. Oh, it comes with some of those touches – Hannah’s sloppy, farting dogs, eccentric locals, enemies who becomes lovers, etc. – but the movie takes on a more serious tone than typical. So we get a romantic comedy that lacks comedy – and one that also largely avoids romance. Take one look at the Blu-ray artwork on this page and you’ll expect a wacky film, but that couldn’t be much more deceptive. It does possess fairly arrogant, unlikable characters, though, and that makes it a tough slog. Sure, the film softens Andrew and – particularly – Hannah as it goes, but they never quite defrost to the necessary degree. We should like them and root for their eventual connection, but we don’t. Instead, we just view them as hipper-than-thou archetypes without much personality to lift them off the screen. It doesn’t help that Sudeikis and Hall enjoy little chemistry. Both are talented, but they fail to connect, and they often feel like they’re in different movies. Neither one seems bad, but neither adds much to the experience either. All of this leaves Tumbledown as a fairly mediocre experience. It lacks the romance or comedy to fit that genre, and the drama seems lackluster as well. None of these factors make it a genuinely bad film, but it never threatens to turn into anything compelling, either. Tumbledown appears in an aspect ratio of approximately 2.40:1 on this Blu-ray Disc. The film came with a generally good transfer. For the most part, sharpness seemed satisfactory. However, a few odd soft spots cropped up from time to time; these were probably intentional, but I couldn’t figure out a rationale for them. The image lacked jaggies or shimmering, and edge haloes remained absent. I also didn’t see any print flaws. Colors tended toward a fairly amber feel. Within those parameters, the hues appeared fine; they lacked much range but they gave us appropriate clarity. Blacks were dark and tight, while low-light shots came across as smooth and visible. Despite the smattering of soft elements, the transfer usually worked well. I didn’t expect much from the film’s DTS-HD MA 5.1 soundtrack, and it delivered the low-key impression I anticipated. Even with some “nature scenes”, the mix stayed with general ambience and lacked a whole lot of ambition. Music delivered nice stereo imagery and the rest of the mix gave us decent ambience. None of this impressed, but the track suited the story. Audio quality seemed good. Speech was natural and distinctive, while music showed warm, full tones. Effects lacked much ambition but they came across with suitable clarity. This was a perfectly acceptable mix for a chatty film. Two featurettes appear here. The Making of Tumbledown runs 22 minutes, 41 seconds and offers info from director Sean Mewshaw, writer Desi Van Til, producers Kristin Hahn, Margot Hand and Aaron L. Gilbert, director of photography Seamus Tiernan, and actors Jason Sudeikis, Rebecca Hall, Joe Manganiello, Dianna Agron. Richard Masur and Blythe Danner. We learn of the movie’s origins and story/characters, cast and performances, visual design, and Mewshaw’s approach to the material. Though a lot of “Making” seems like standard promo fare, we get some decent insights, mostly from Vsn Til about inspirations for her script. The Music Behind Tumbledown lasts two minutes, 48 seconds and features Mewshaw and singer Damien Jurado. We learn how he movie brought the Hunter character to life. Despite its brevity, “Music” works fairly well. The disc opens with an ad for Just Before I Go. No trailer for Tumbledown appears here. 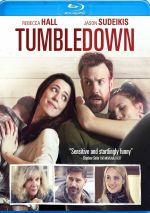 Without much humor or passion, Tumbledown delivers a lackluster romantic-comedy – and it doesn’t fare much better as a drama. Despite some talented actors, the movie fails to engage. The Blu-ray offers generally positive picture and audio along with minor bonus materials. Tumbledown winds up as a mediocre experience.